The cosmic origins of Earth and our entire Universe have always interested man. 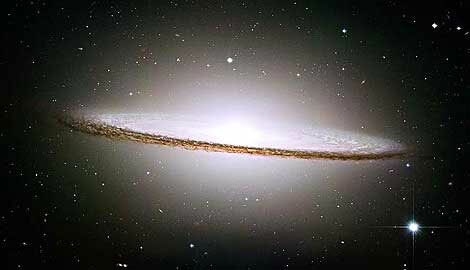 Over the centuries there have been many different explanations about how our Universe came to be and why. Many of these explanations centered around cultural and religious beliefs that were passed down from generations to generations and taken for granted. During the last century many scientists from all over the world and from many different cultures and religions have discussed and proposed a unifying theory of how the Universe began which takes into account much of the scientific findings that are accepted today. This theory is called 'The Big Bang Theory' and is presented here in a simplified form. The images are mainly from real celestial images taken by the United States Hubble Telescope and chosen to represent parts of the theory. Other ideas are still believed by many people, especially those that involve various religions but the Big Bang Theory is one of the few that is accepted by most scientists worldwide. The Big Bang theory begins with an original, immense explosion (the 'bang') some 15-20 billion years ago. Material, from this explosion was flung everywhere and the heat was so intense that it is postulated that in the first fifteen minutes it was too hot for anything to exist. The energy from this explosion caused the material to move out from the center in a non-uniform manner. Matter began forming after some 300,000 years with the first forms being what we call 'particles.' These particles are the protons (+), neutrons (o), and electrons (-) we have discovered that make up our atoms. As the explosion material and particles slowed down a bit, from the original explosion, they began to coalesce to form aggregations. Electromagnetic forces caused protons, neutrons and electrons to form atoms with protons and neutrons in a nucleus and electrons in orbits around nucleus. Most early atoms were hydrogen (1 proton and 1 electron), the simplest of our atoms. We define atoms with different numbers of protons and electrons as different 'elements,' each element having a defined number of nuclear protons with the same number of electrons. The elements are arranged in what we call the 'Periodic Table' to show the relationships between the atoms (hydrogen, with one proton is first; helium, with two protons is second; and so on). 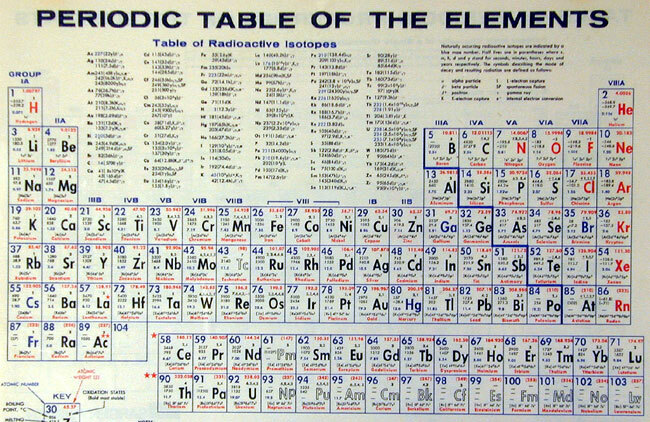 Each element has its own chemical properties. Star birth occurs when masses of hydrogen (and some helium from fusion of hydrogen) get sufficiently dense and hot (from gravitational attraction) to 'ignite.' Ignition temperature is 20,000,000 degrees Fahrenheit - the temperature at which nuclear reactions occur. When a star has ignited, the nuclear reactions create heavier elements. A 'nuclear reaction,' in this case, is the fusion of the nucleus of two atoms into one atom. The new atom is thus heavier than either of the original atoms and has different properties. The fuel of a star is hydrogen (the smallest atom) and the reaction that keeps the star alive is the nuclear reaction called fusion. Each star has a certain amount of fuel and when that fuel is used up the star dies. Since the original explosion was non-uniform the location of stars is also non-uniform. Groups of stars in this non-uniform distribution may form what we call Galaxies. 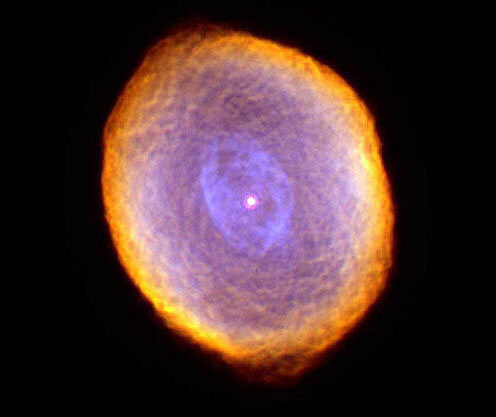 Star death occurs when enough hydrogen is used up and the star becomes unstable and explodes. These stellar explosions are called novas and result in the stellar material (leftover hydrogen and all the heavier elements that have been created, including iron) being flung everywhere. This is kind of like a mini big bang. This material may hit something, continue out, or parts of it may come together (from gravitational forces) to form another dense mass. This is like a recycling system in our Universe. Astronomers have evidence to support the stellar explosions. As early as 1604 Kepler studied a super nova event and recorded it. The origins of our planet, Earth, begin with our sun (Sol). It is about 5 billion years old and is a star at the center of our solar system (our sun plus the planets associated with our sun). There are a couple of theories about the formation of our solar system. One states that it may have formed from a disk-like area of material around our sun that did not get sufficiently sucked in to be inside the mass of Sol. This material eventually coalesced into the various planets at different distances from the sun. The other theory states that our solar system may have formed from a collision of Sol with remnants of a nova when it was 1/2 billion years old and this collision caused material to be flung away from the sun. It was this mixture of the remnants of a nova and material from our sun which is theorized to have condensed and formed the planets of our solar system in this alternate explanation. Earth was originally a hot molten mass however it began. It is thought to be 4.5 billion years old - younger than our sun. This date is from rocks found on some of the oldest continental areas that are thought to have been present from the beginning. The hot molten mass of Earth began to cool after its formation. Lighter material formed crust (covering the outside of the planet) and cooled, while volcanoes on the surface vented molten magma, gases and water. The magma cooled into the solid crust, the gases stayed close to Earth as an atmosphere (held by gravity), and the water vaporized (due to the heat) and stayed in the atmosphere as water vapor. Scientists find magma, gases and water venting from today's volcanos and feel it was probably the same condition in early Earth. 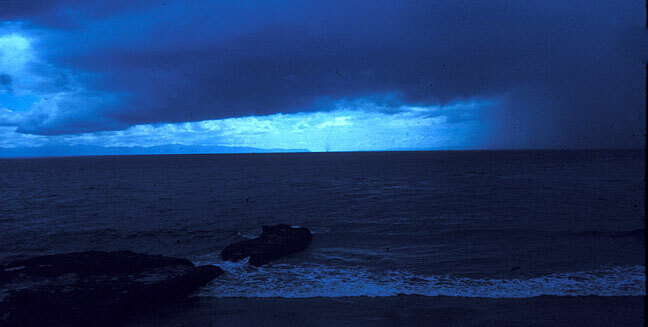 Rains created the original seawater when earth cooled to below the boiling point of water. The water vapor in the atmosphere condensed and when it rained the water no longer vaporized on the surface of Earth. The water hit new crustal rock on Earth that had not been touched by water before. This water leached minerals from the atmosphere (on the way down) and from the rocks (crust) on Earth. These minerals were numerous salts that dissolved in the water and created the original load of salt in our oceans. Today scientists can take the new rock material from volcanos and subject it to water and get salty water. Earth's oceans formed when this salty water (with the leached mineral salts) collected in the depressions of Earth. Earth has a general water cycle (evaporation and precipitation) now where water is evaporated into the atmosphere (as clouds) and then it falls somewhere else as precipitation. It may change forms for awhile (be incorporated into an organism, or frozen as ice) but little new water is created at volcanos (because there is relatively little active volcanism). 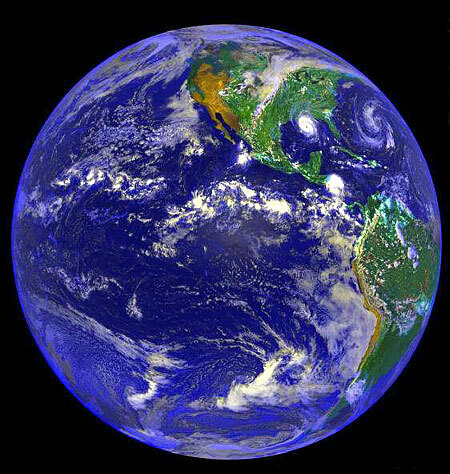 The original state of Earth was such to create all this water and the temperature of Earth is such that water stays as a liquid over much of the surface now. Planets closer to the sun are too hot for liquid water (it evaporates) and planets farther from the sun are too cold for liquid water (it freezes). Our planet, Earth, is at just the right distance from the sun, the zone of liquid water, for us to be the 'water planet' and have oceans. Earth's crust still rests on molten magma (see the Marine Geology lesson in the physical ocean chapter of this course for a detailed description of how this crust forms and moves under the ocean). Our environment on Earth includes interactions between the life forms, air, crust and water. We often refer to these different parts of the environment as many 'spheres.' The biosphere includes the life forms. The atmosphere includes the air. The geosphere (sometimes called lithosphere) includes the crust. The hydrosphere includes the water. All these 'spheres' interact together to produce the environment on Earth. One of the most spectacular of these environments is the marine environment.